Don't sit stationary, go and buy the best stationery! From buying on-trend pencil cases and S Club 7 folders as kids, to picking out a tasteful notepad today, the best stationery continues to pay a part in our lives, despite the tech industry's best efforts to make the world paperless. It's a classic affordable luxury. Here at T3 we love our laptops and tablets, but there's still room in our hearts and drawers for diaries, organisers and nice pens. For this guide, we've even shoved in a fancy paperweight, as well as one-stop-shop stationery sets. So, let's get organised the analogue way, with the best stationery money can buy. If there’s one place, aside from your phone, where you can ensure that your life runs like absolute clockwork, it’s within the pages of this marvellous Aspinal of London personal organiser. They have literally thought of everything; from week-to-view planning to 6-month-to-view planning. From pages where you can jot down your goals to ones for your expenses. Add to that a calf leather exterior and a suede interior, and meeting room kudos points are a certainty. When you name your company after the highest mountain in Europe, there’s probably an immense amount of pressure on your shoulders to get it right, and the master of luxury penmanship Montblanc certainly has here. Featuring a resin cap, lacquer barrel and gold-coated serpent clip, this pen reeks of disposable income; but it’s flashy, finessed and will certainly make note-taking a luxury. Choose from a range of Montblanc refills, including Mystery Black, Pacific Blue and Nightfire Red- for really showing them who’s boss. A considerable step up from inscribing The Cure on your school English book, this is as classy as a notepad can be, whilst sporting a cartoon of Mick Jagger's bulbous lips and protruding tongue. This Rolling Stones notebook in velvet no less, come from stationery giant Moleskin. The hard cover protects it when battling around in your bag, it's got ruled pages and there's an expandable inner pocket for slipping in expenses receipts. With this notebook, you will get 'satisfaction'. And if you don't like the colour you can always paint it black. Some people live to work, while others work to live, but whatever your attitude to life, a holiday – or even an extended holiday – is always welcome. If you know that a colleague is just about to take 3 months off to travel the world, make sure they take a little part of the office with them on their travels with this compass paperweight. You can even send them off with a personalised 'cheerio' message, engraved on the outside. Celebrate your position on the property ladder and save yourself the effort of writing out your address by hand with this personalised addres stamp. If you're going to all the effort of sending a letter, when everyone else is using email, you may as well do it in style. 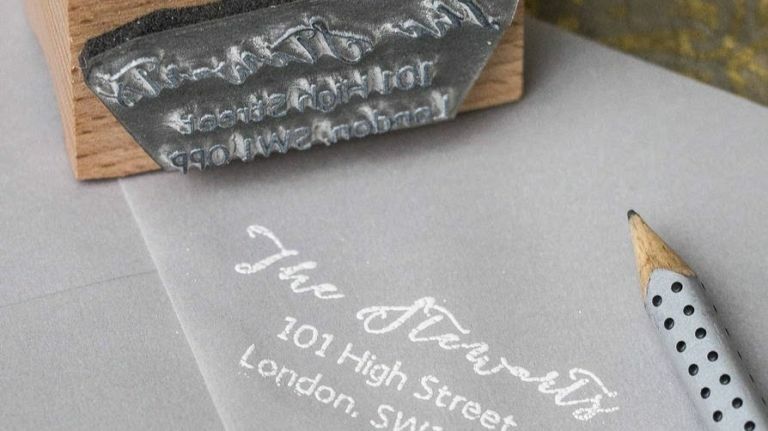 This calligraphy address stamp is available in a range of sizes, depending on the length of your name and address, and you can choose from a range of fonts and ink colours to reflect your personality. Comic sans in pink, then. Parker is arguably the world's most famed pen name, and has already forgotten more about making fountain pens than you'll ever know. Take satisfaction in writing notes in the kind of lovely, elegant writing that can only be produced from the tip of a fountain pen. Constructed from anodised aluminium and arriving in a beautiful protective box, this pen should be treated with respect. If the inner work you is chanting ‘stay professional, stay professional’ but the downtime you is chanting ‘go funky, go funky’, harmonise with both and combine the two with this pencil case from Kate Spade. The gold spots on the black background give it a fun element, but its reserved enough for you to comfortably leave it out on your desk with no risk of judgement. It comes with two pencils, a sharpener, eraser and ruler too, so you’re pretty much set.